The first place I discovered independent artists creating incredible and off the wall t shirts was Threadless. It was definitely the gateway to my t shirt addiction. The idea that anyone could submit a design and the community would then vote to decide what was printed was (and still is) really cool. I found myself buying a new shirt almost every week, and even joined their "shirt-a-month" club. My tastes have since changed a little since then, but the caliber of art has remained almost unchanged. The classics continue to blow my mind, and I still make a purchase from them every few months. 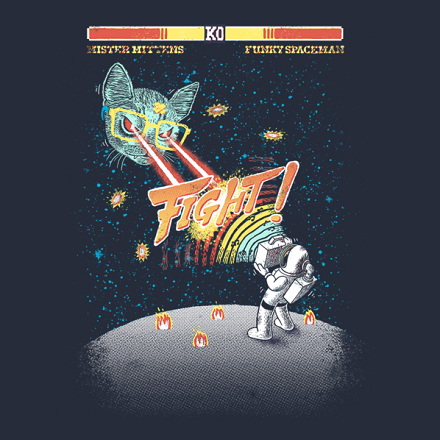 Julien Croyal's (aka JulienTees) "Space Fight" breathes new life into two of the most recognizable designs. He's pitted them against one another in a videogame-esqe battle for t shirt dominance. You can find it now in the JulienTees' TeePublic shop with the option of four different color blanks.